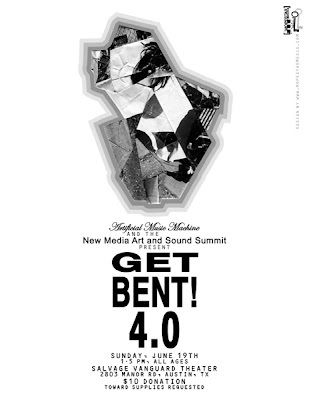 New Media Art and Sound Summit and Artificial Music Machine present the fourth installment in a series of circuit bending events titled Get Bent! The afternoon will begin with a short presentation by Artificial Music Machine co-founder and sound artist Thomas Fang on the history and theory of circuit bending, defined as the creative short-circuiting of electronic devices that produce sounds. Background information. The bulk of the event will consist of a hands-on workshop in which participants will modify electronic devices to produce new sounds. Soldering irons, wire, switches, potentiometers, and some devices will be provided, but attendees are encouraged to bring screwdrivers and inexpensive electronic toys to bend. Examples: small keyboards, Speak & Spell, Furby, Barbie karaoke machine, toy guitars, etc. No previous knowledge of electronics is required. After the workshop, from 4-5pm, everyone with a device can plug in for an open jam session! New Media Art and Sound Summit: http://www.nmassfest.org"